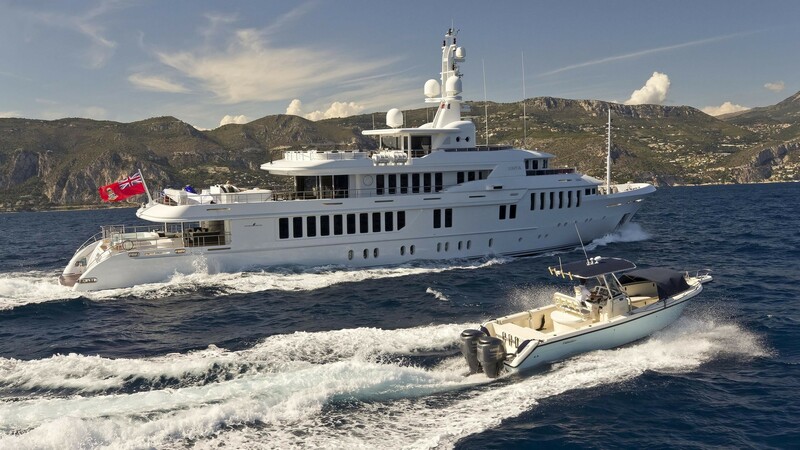 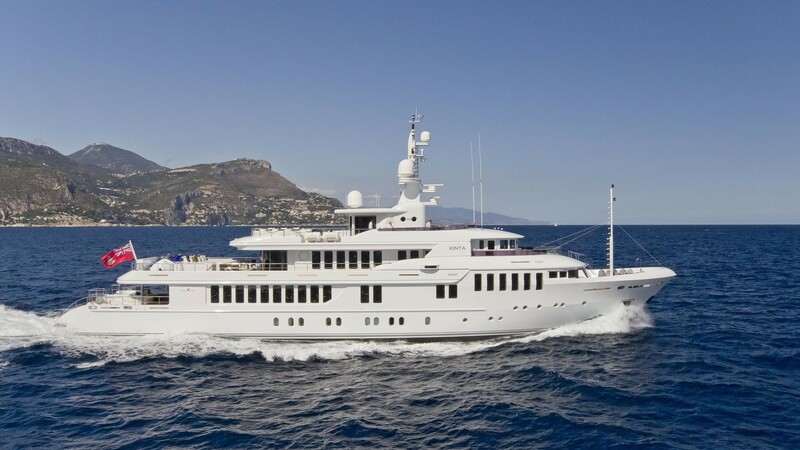 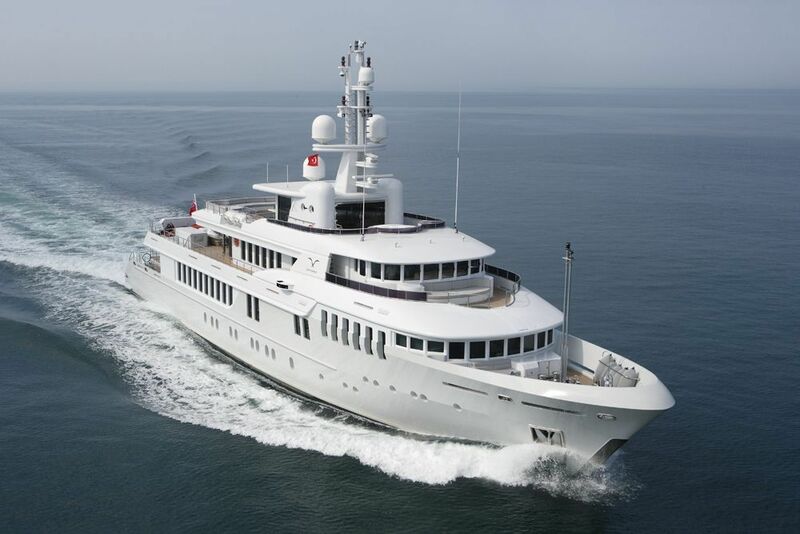 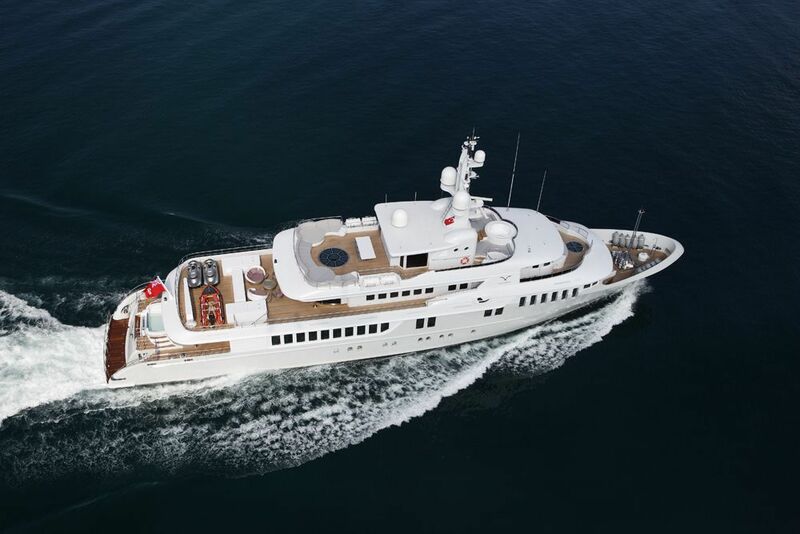 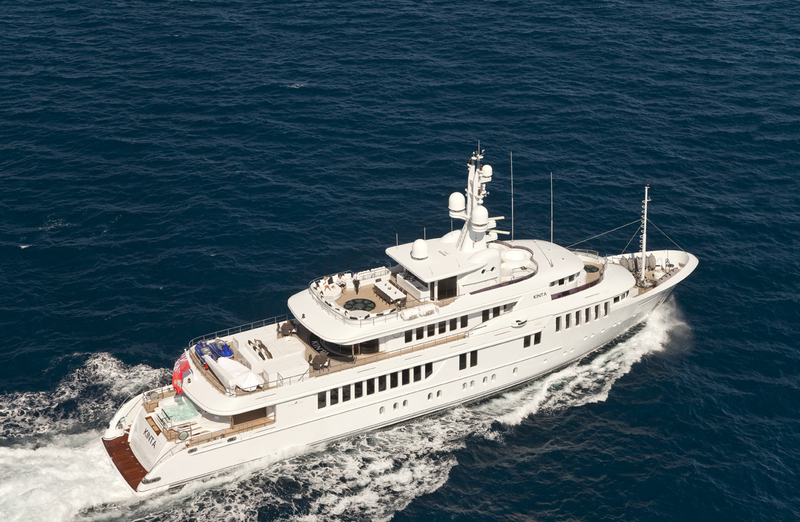 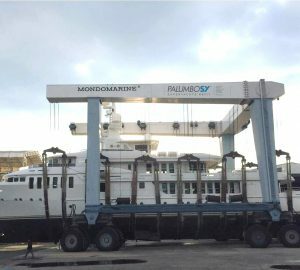 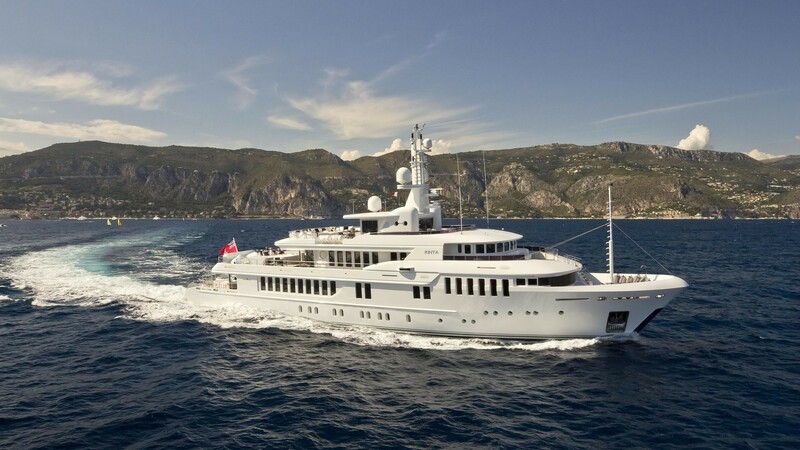 KINTA (ex VINYDREA) was built by the Turkish shipyard Proteksan Turquoise was designed by Paolo Caliari in collaboration with Proteksan Turquoise Design Departments. 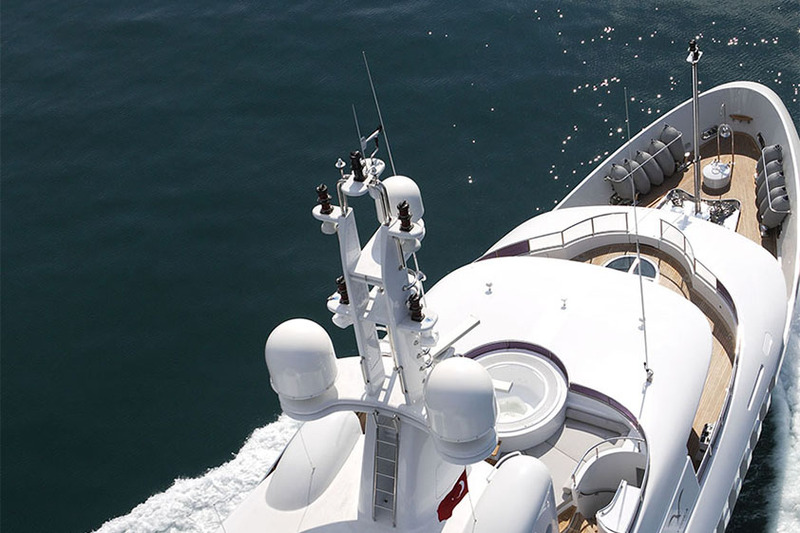 This 54m motor yacht was launched in 2008 and boasts exceptional characteristics and styling structure. 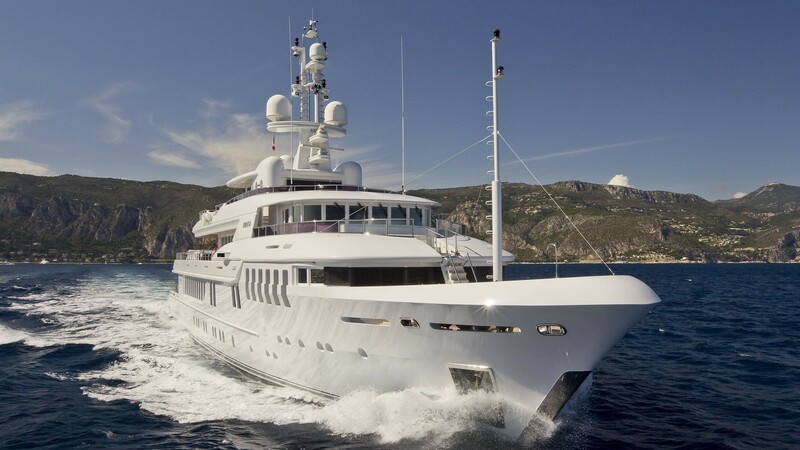 Her design includes a stable steel hull, zero speed stabilizers and aluminum superstructure allowing for great stability, efficiency, and seaworthiness. 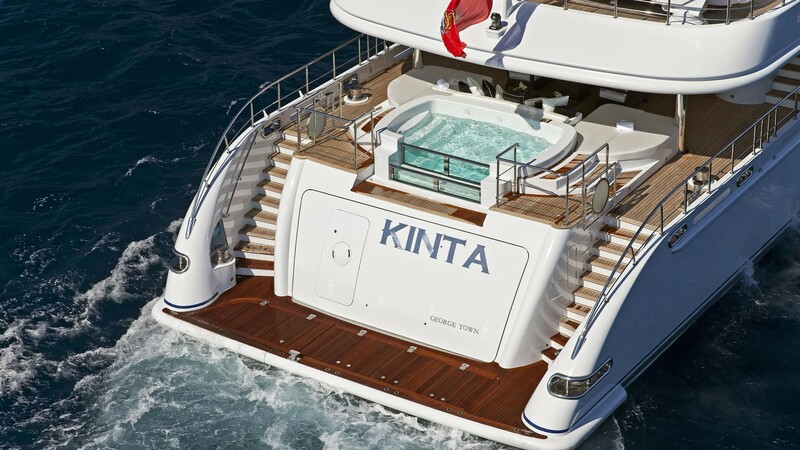 From the hull lines, the design is adapted to KINTA’s world-class standard giving her efficiency, seaworthiness, and safety. 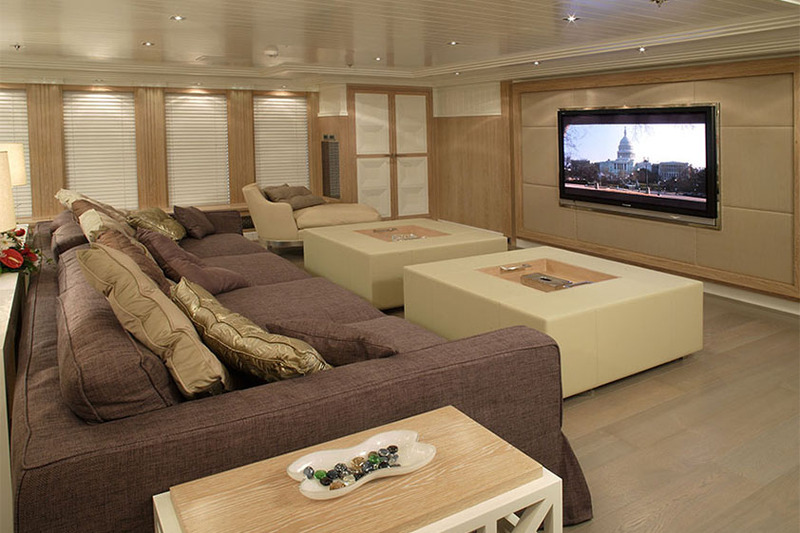 Deck spaces are generous for outside entertainment. 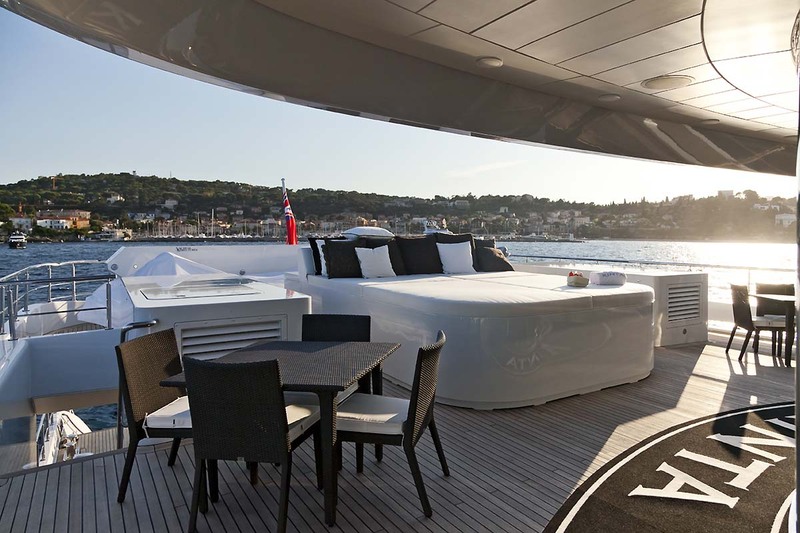 Her excellence in design extends to the decks which were designed for increased space and for a yacht of her length she offers exceptional volume. 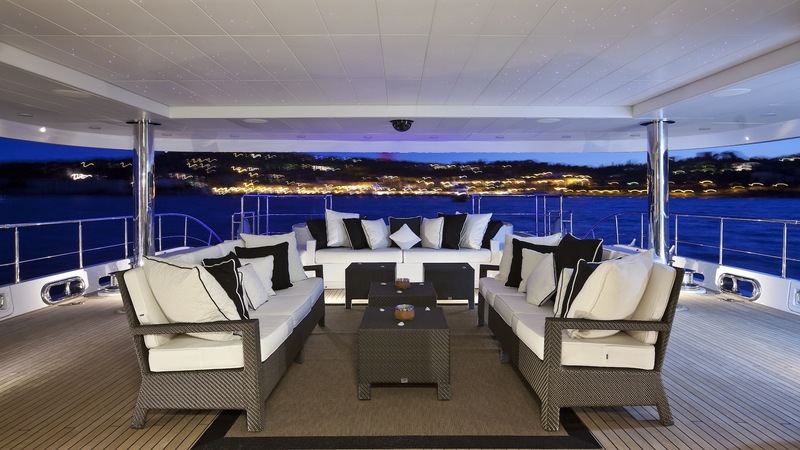 On deck, the main aft deck is a wonderfully relaxing area which boasts a large shaded lounging space and a big pool/spa with a waterfall wall. 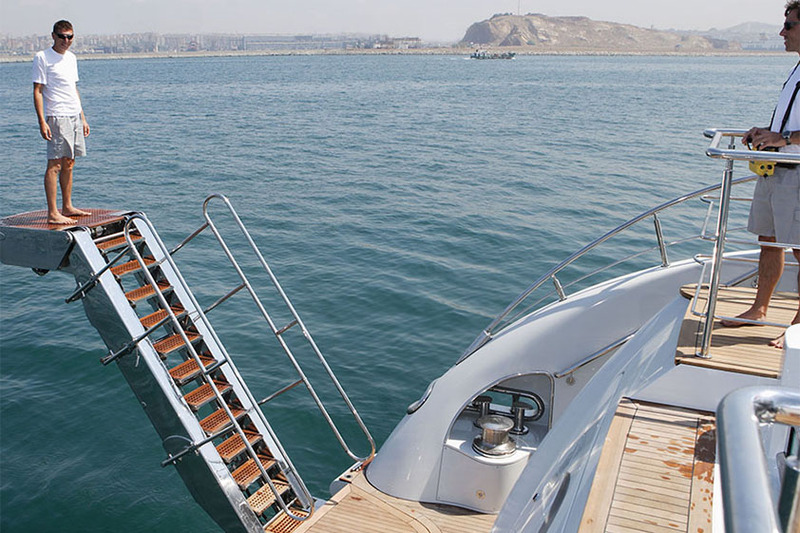 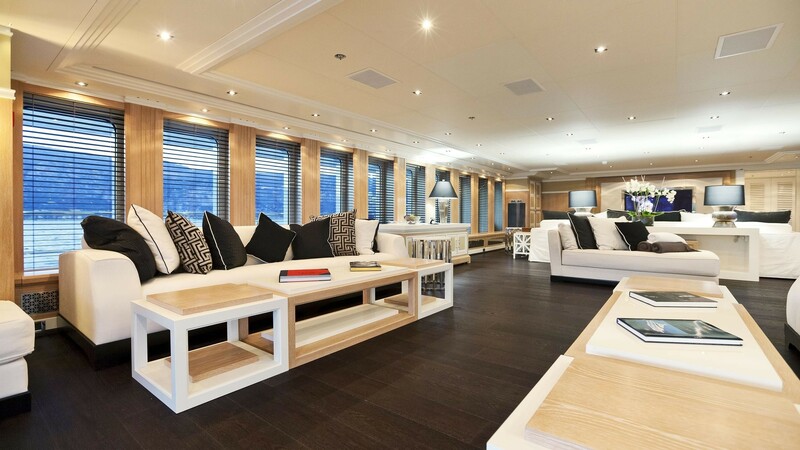 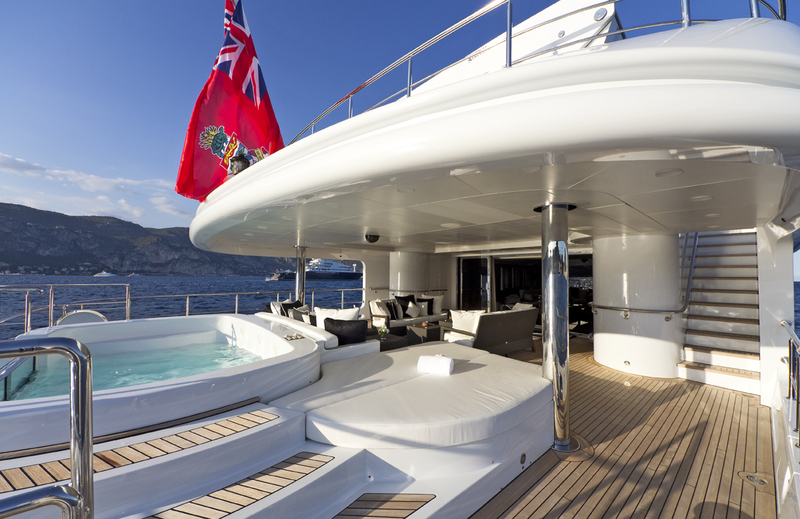 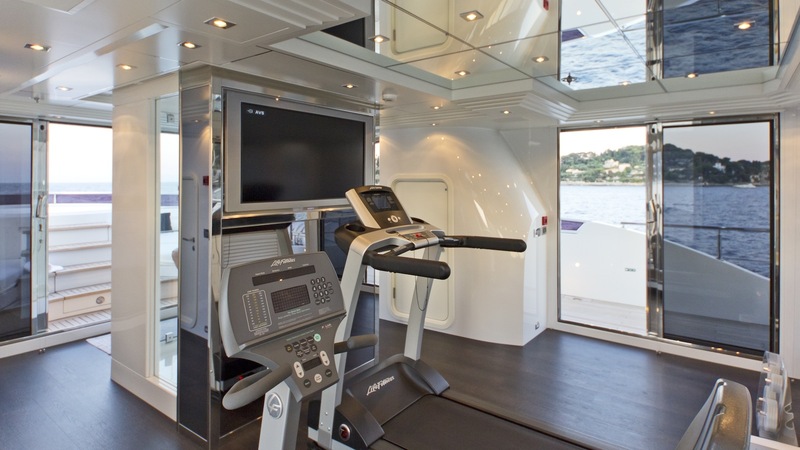 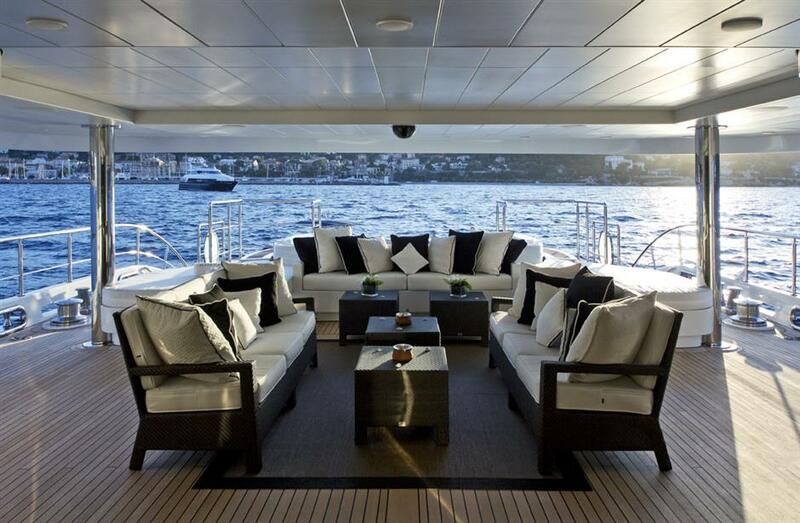 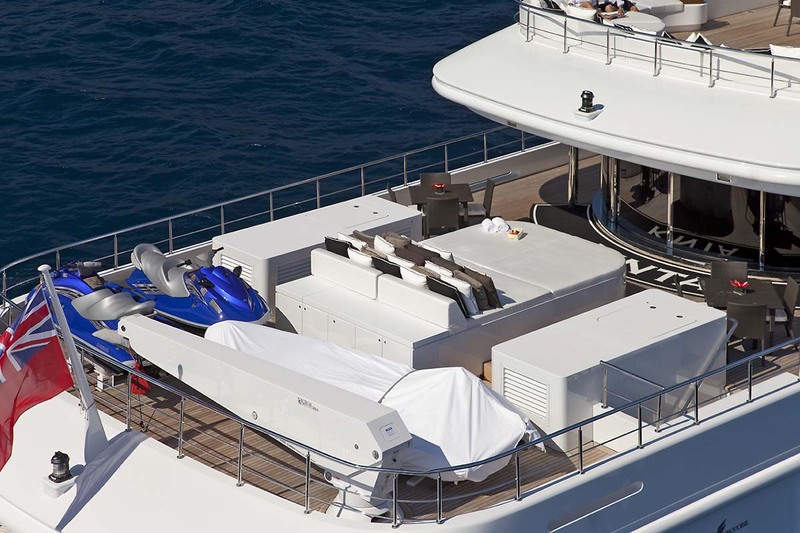 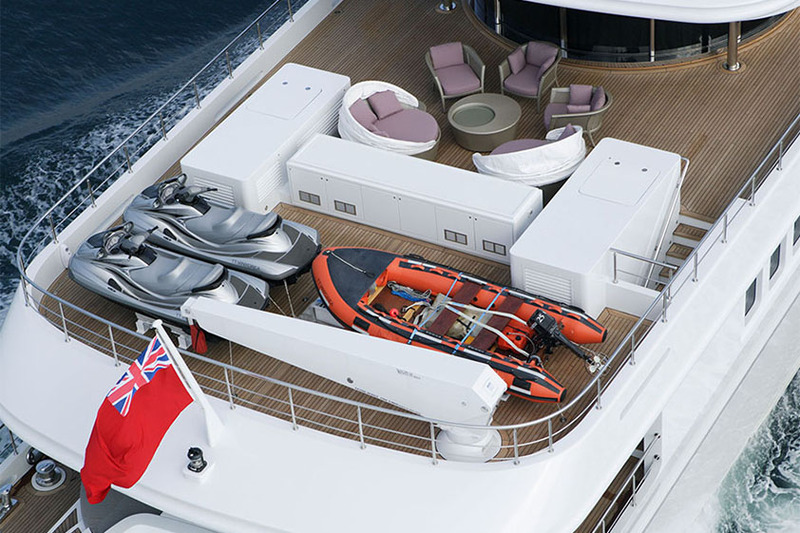 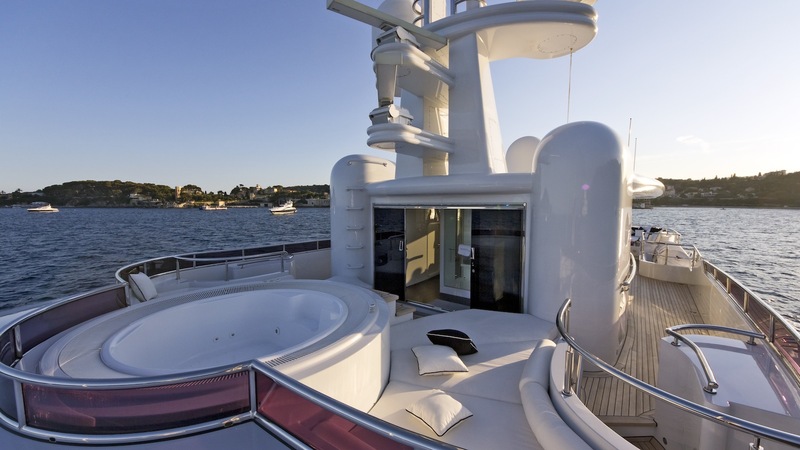 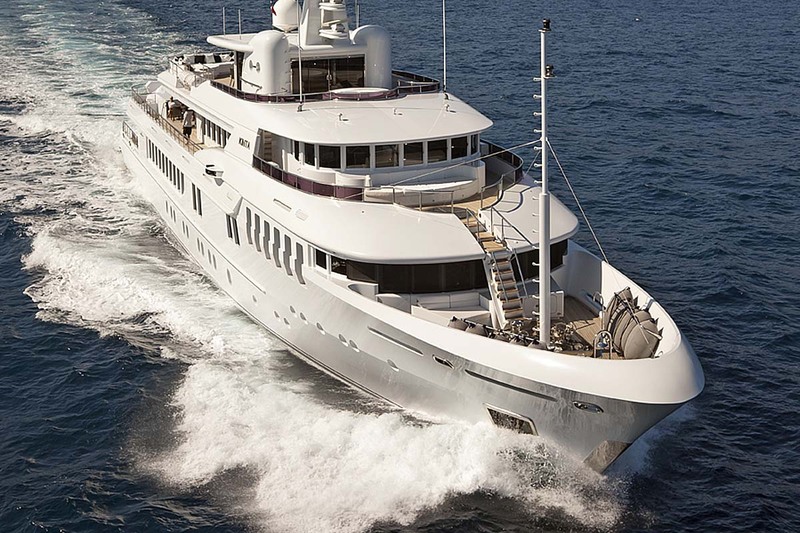 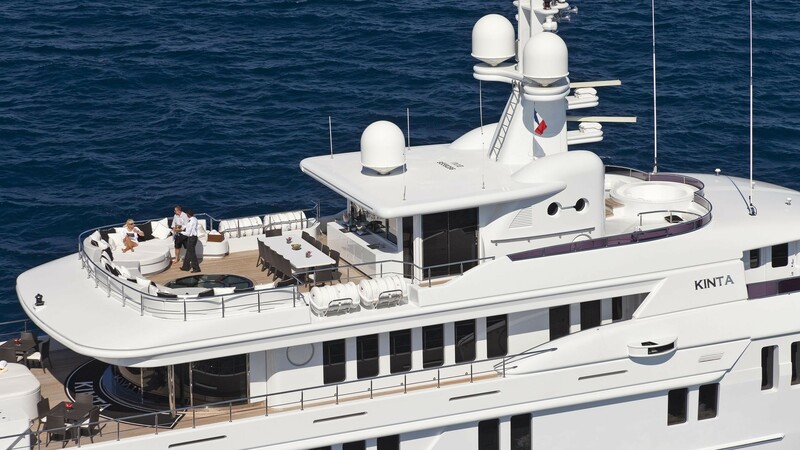 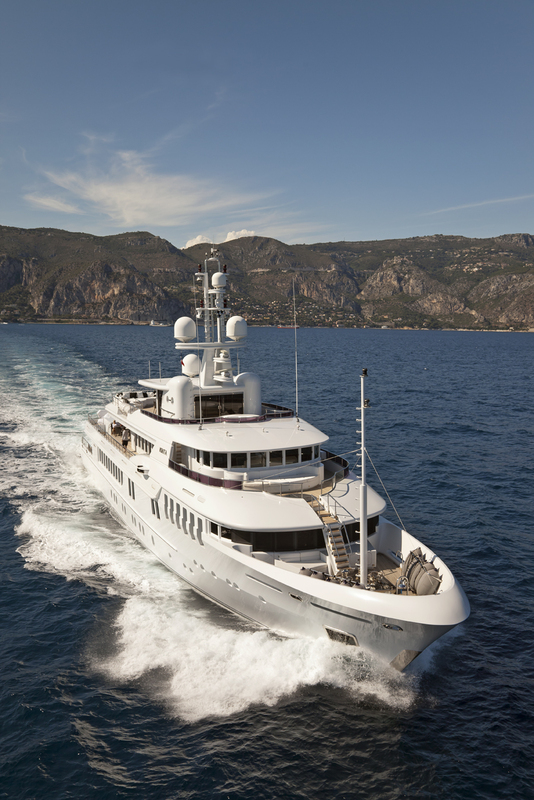 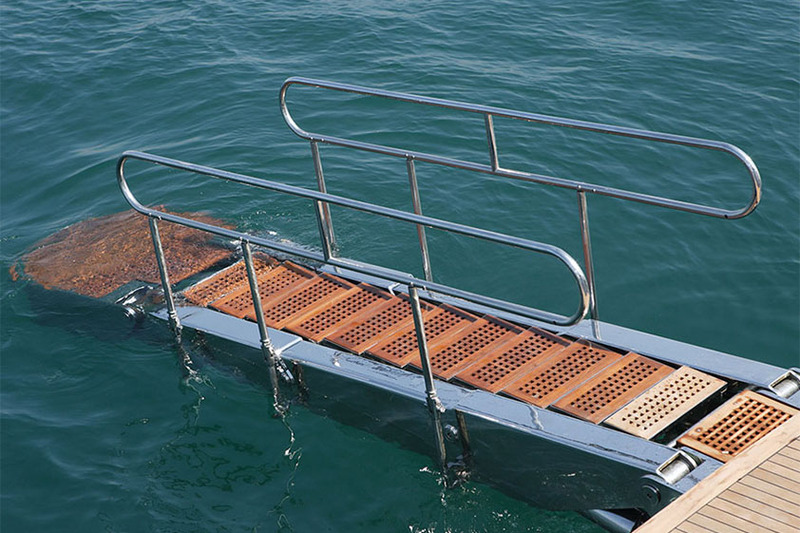 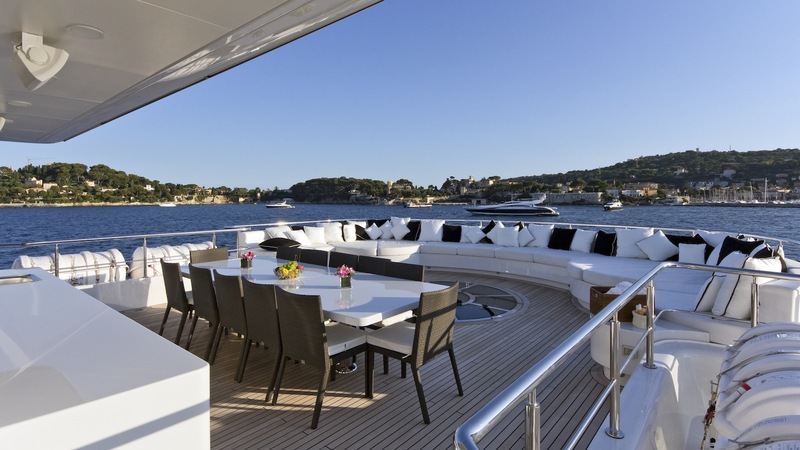 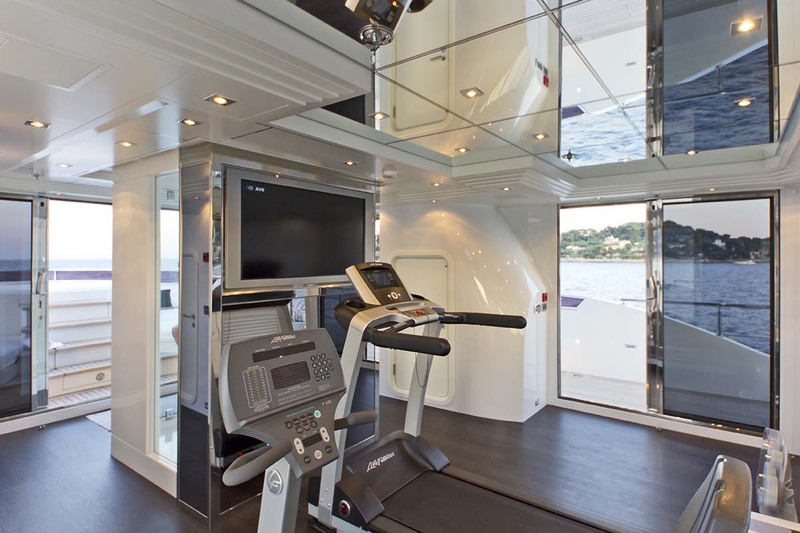 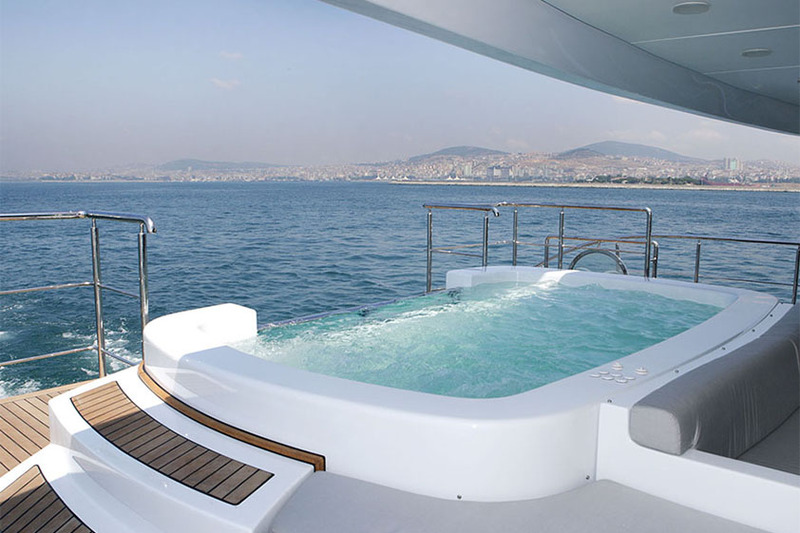 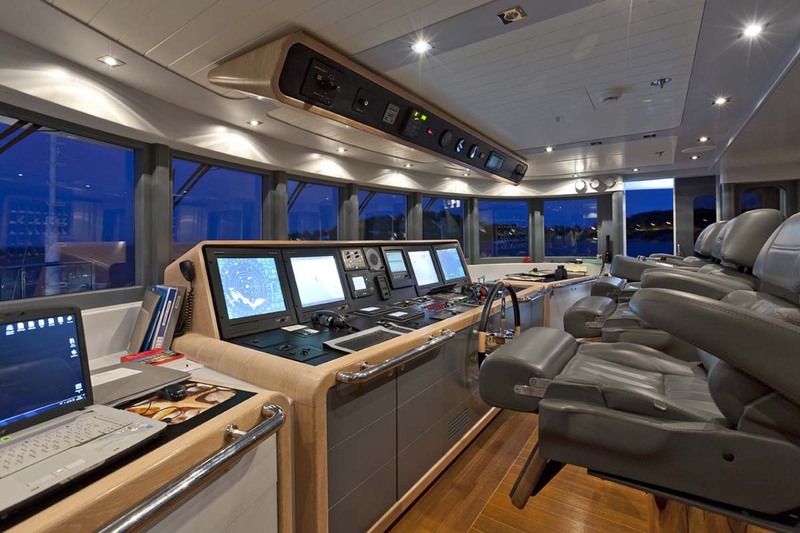 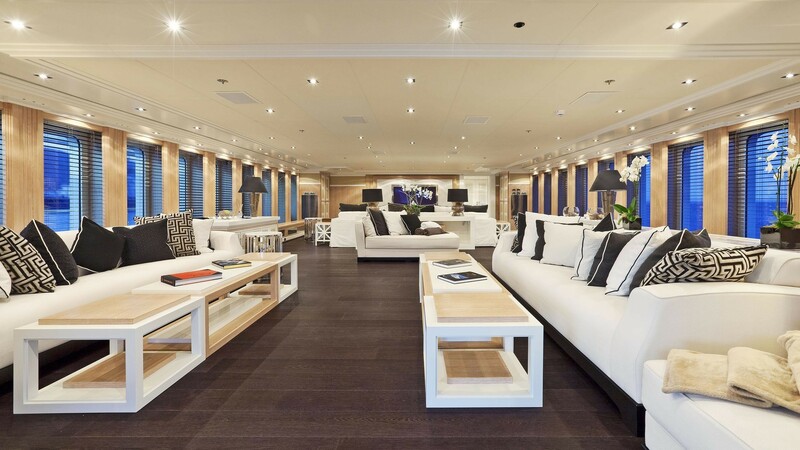 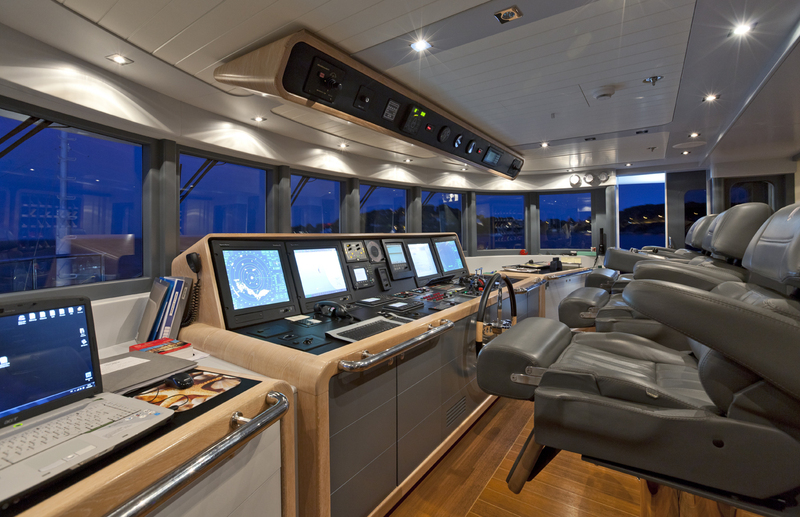 The main aft deck flows down to the swimming platform aft and through to an expansive 100 sq. 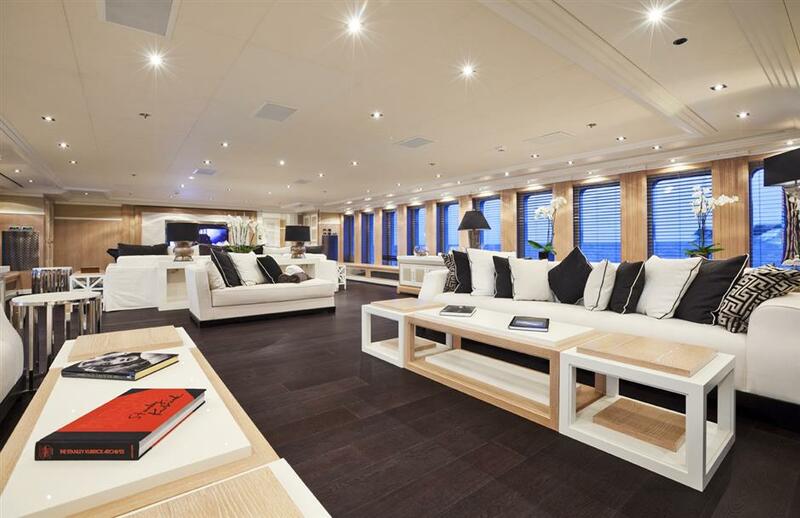 Meter main salon internally. 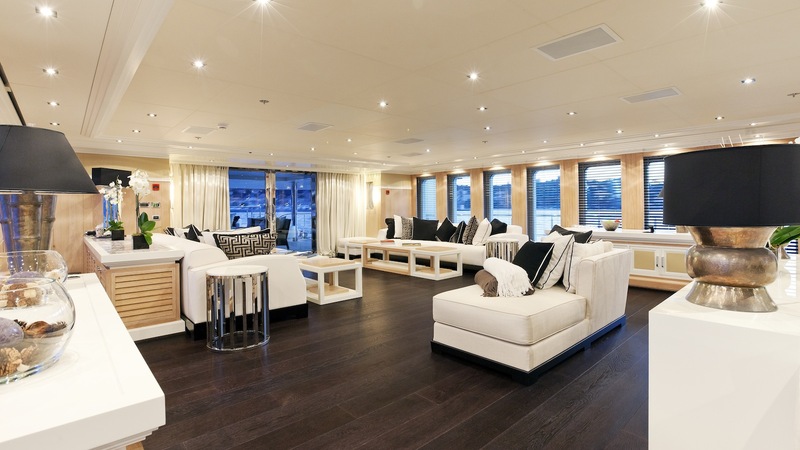 This spacious room is complemented by panoramic windows offering plenty of natural light to the interior. 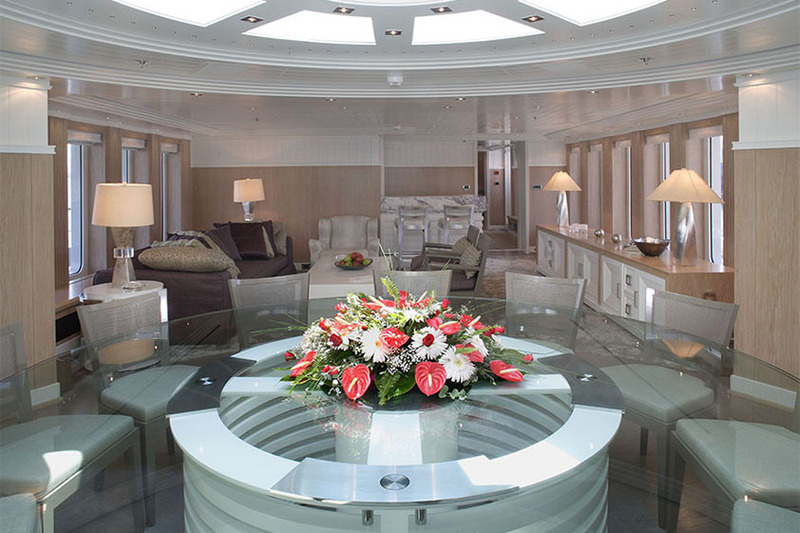 Forward of the main lobby is the oversized master cabin which extends across the full beam of the yacht and is again complimented with full height windows offering spectacular panoramic views. 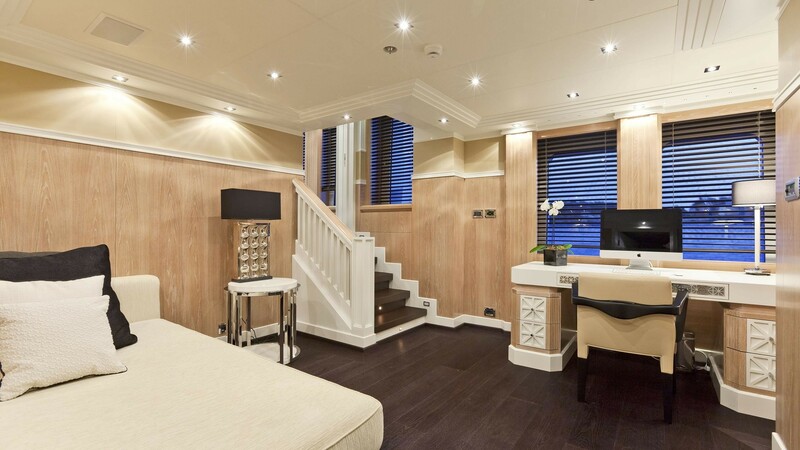 The master stateroom includes a private lounge and office, a large walk-in wardrobe and an ensuite bathroom. 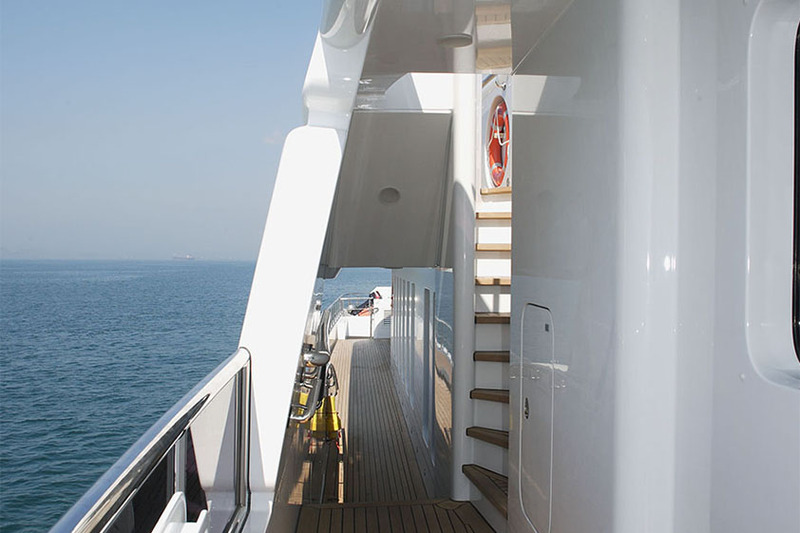 The master cabin also benefits from a private exit forward onto a decked terrace. 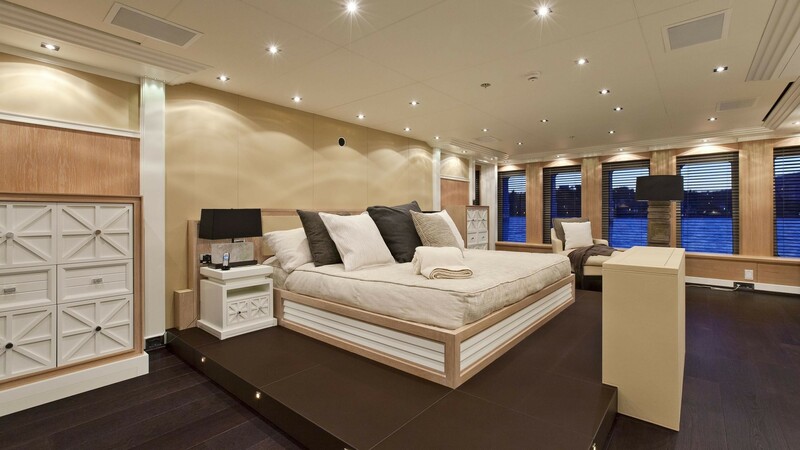 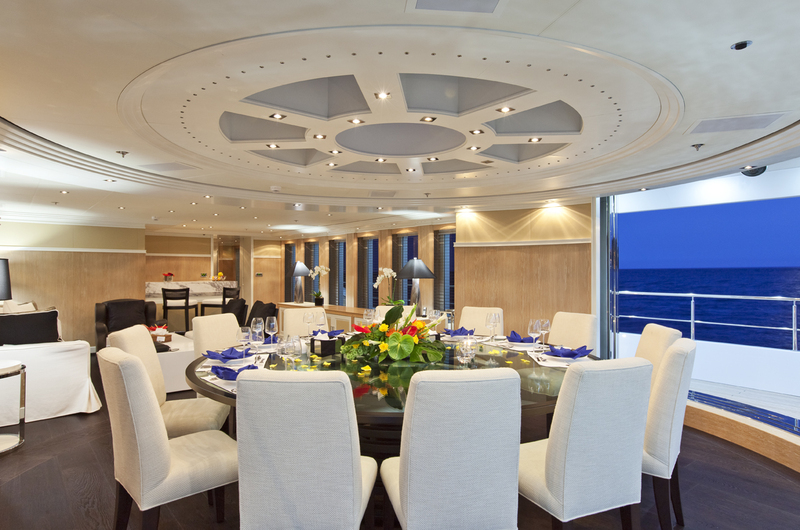 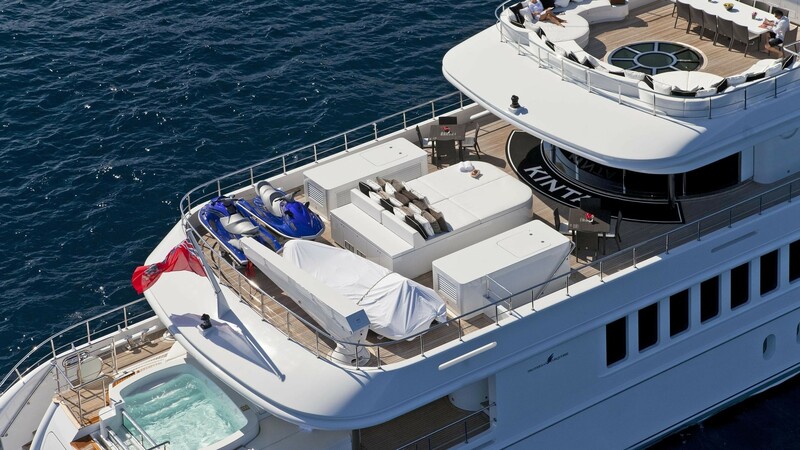 All other staterooms are located on the lower deck of motor yacht KINTA. 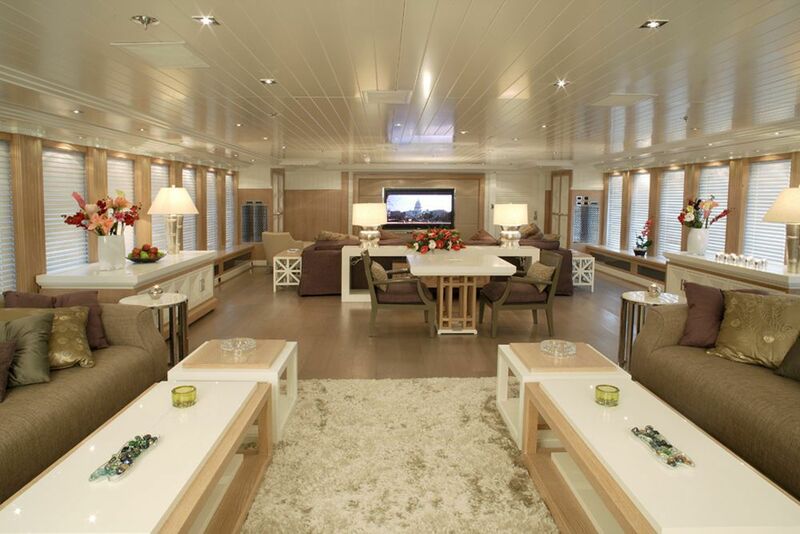 These consist of a full beam VIP stateroom and four guest cabins – three with double beds and one with twin beds. 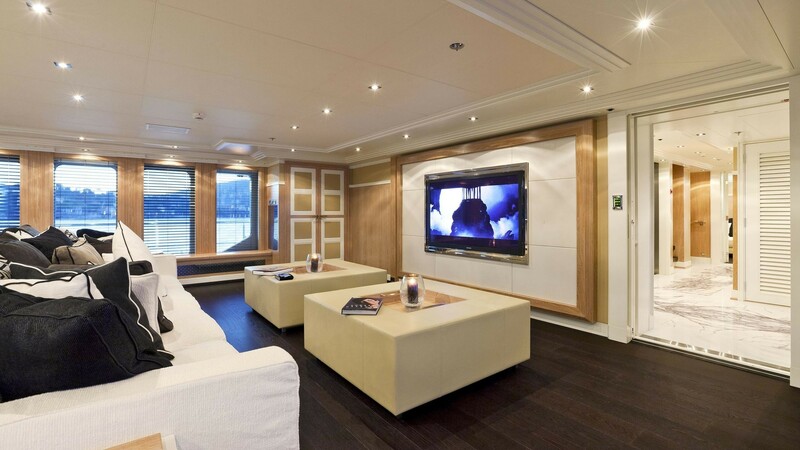 The VIP cabin has a lounge area and a walk-in wardrobe additional facilities including a Spa Pool and shower in the ensuite. 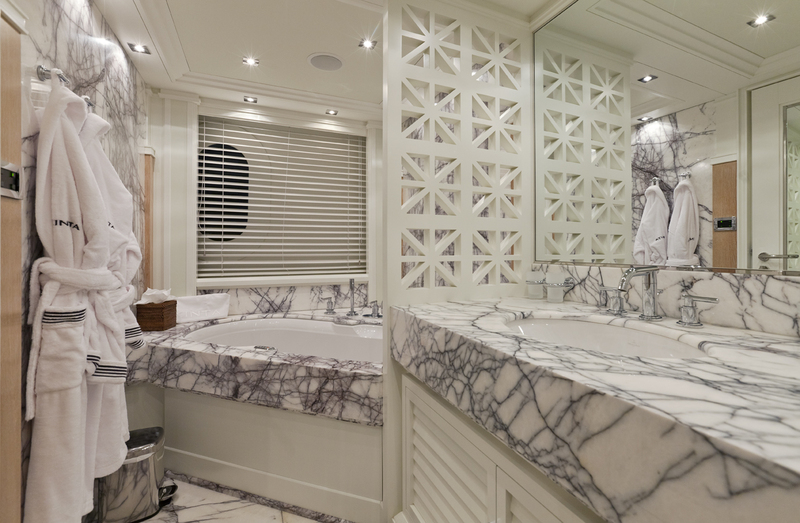 All guest cabins have private ensuites with shower facilities. 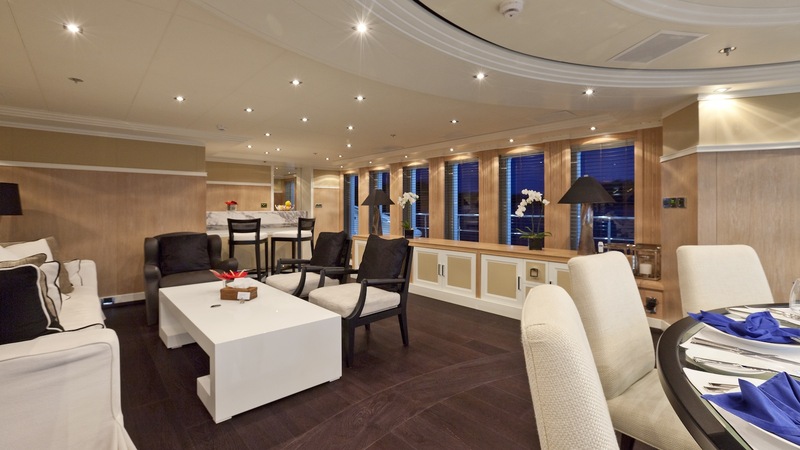 Moving up to the bridge deck, guest will find the formal dining room and a second elegant lounge salon. 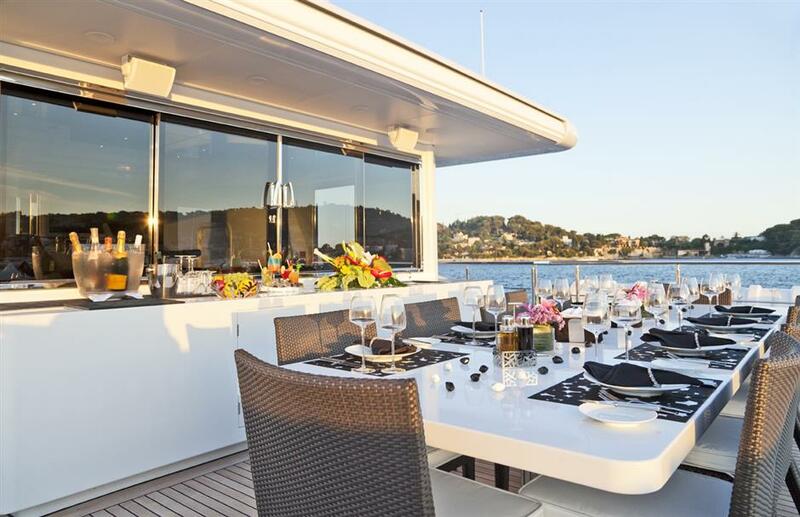 The bridge deck is equipped with a circular sliding door system which can provide guests with the opportunity for alfresco feeling dining in a protected area. 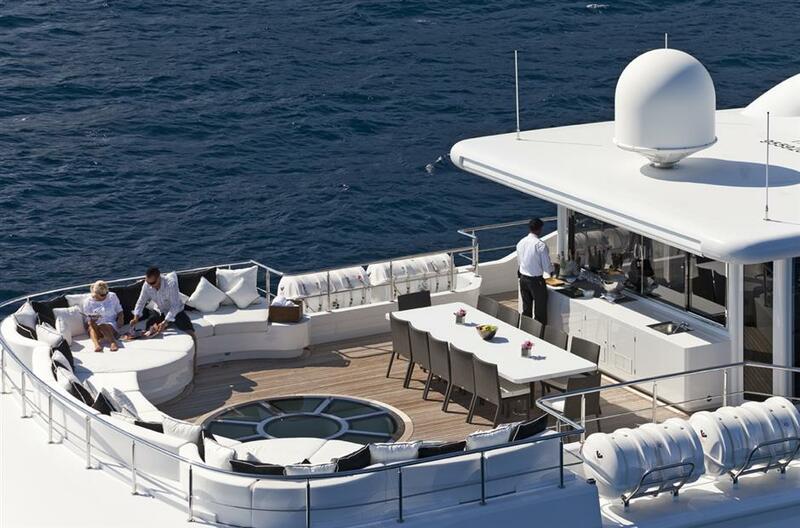 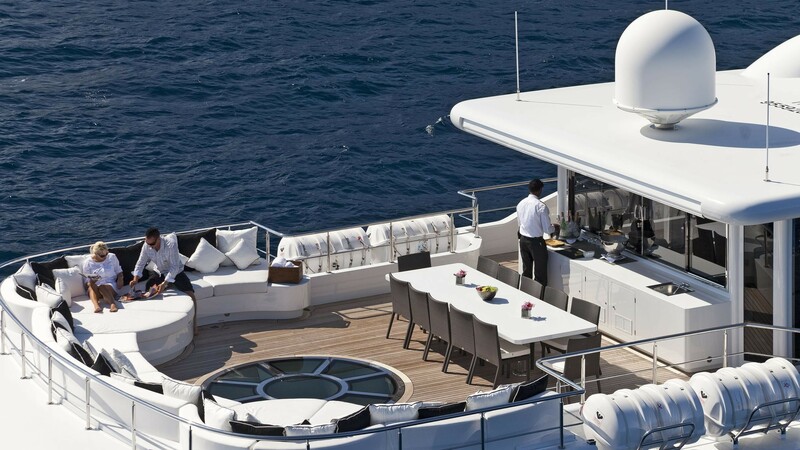 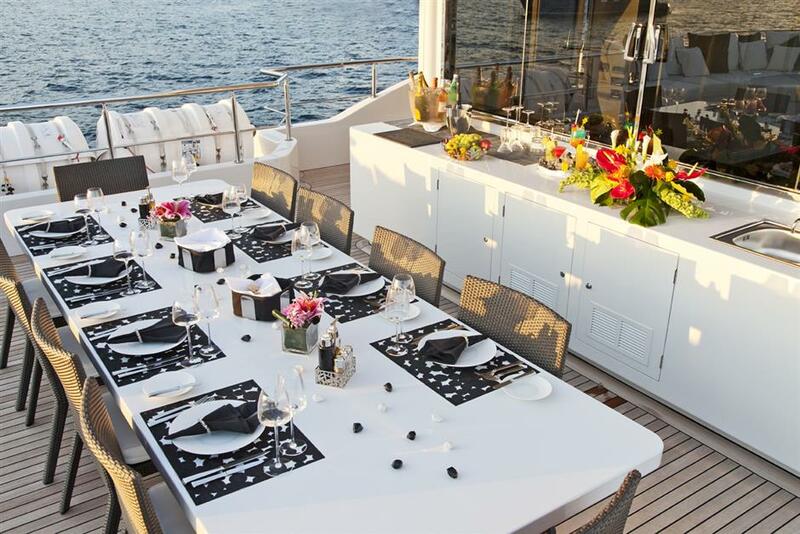 On the sun deck, more alfresco dining is offered under the shaded protection of the hardtop. 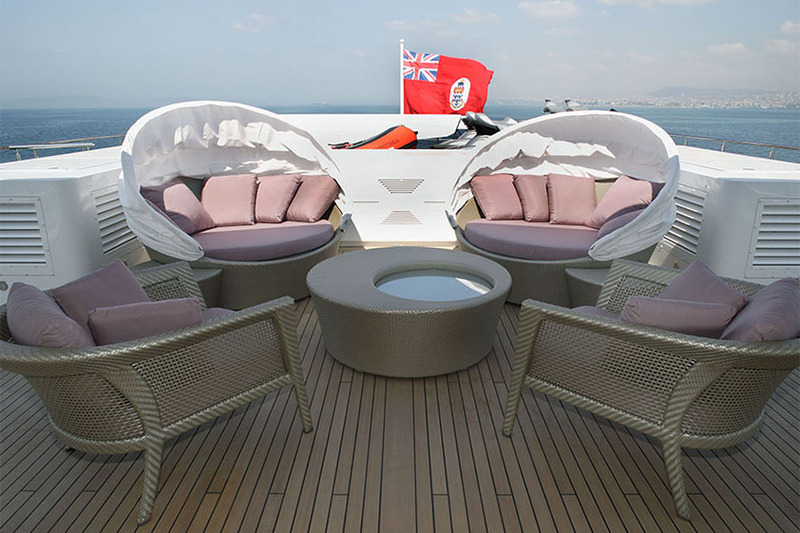 The area forward on the sundeck features a second large Spa Pool complimented by sun-pads, a large gymnasium and a health SPA. 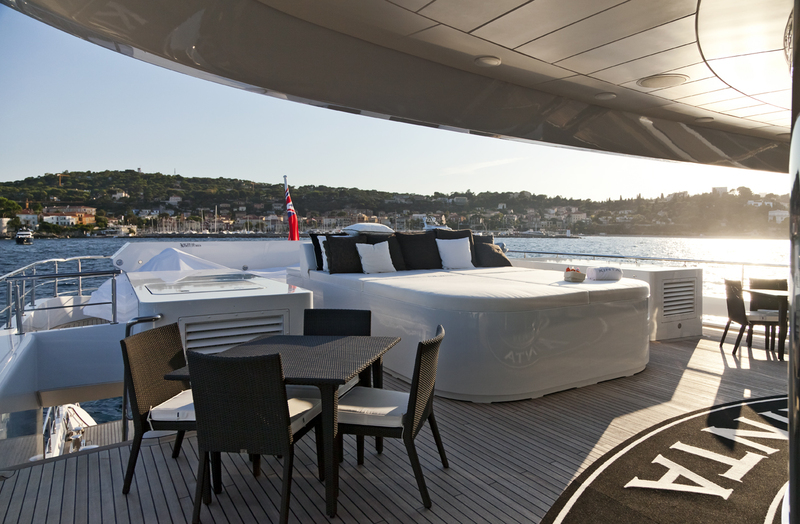 Retractable awning offer guests flexibility to relax in the shade or to enjoy the warm sunshine. 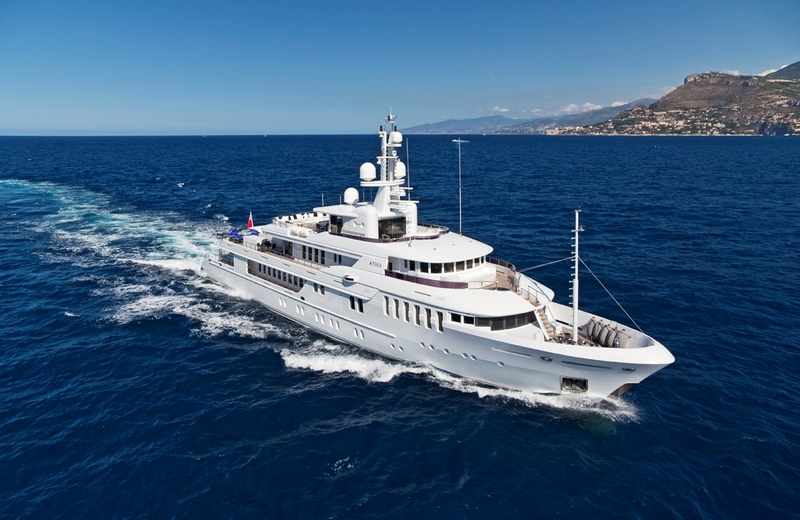 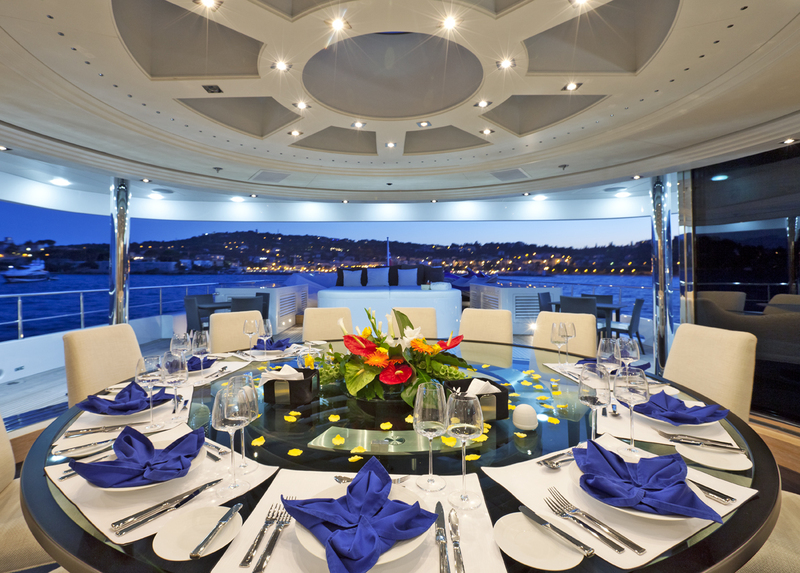 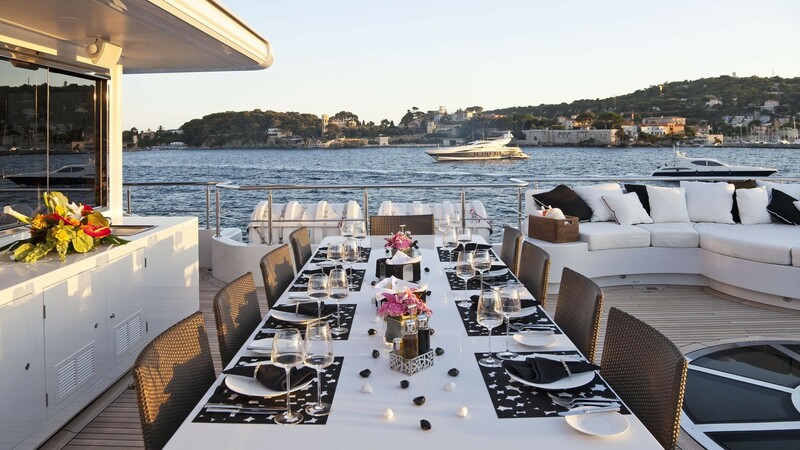 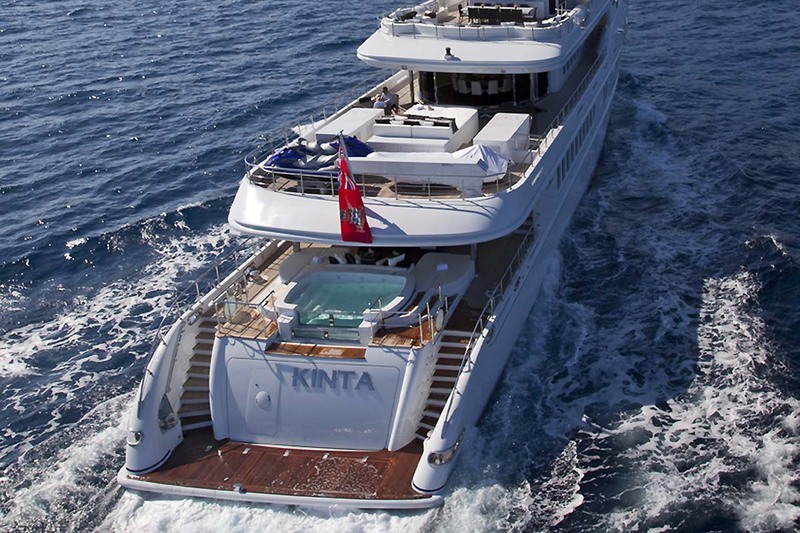 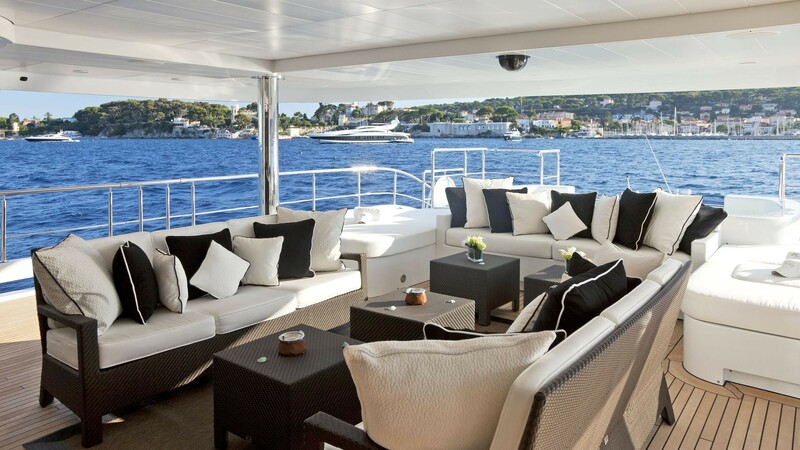 With her unique and creative design, excellent volume and space and elegant decor, KINTA offers discerning guests a wealth of cruising pleasure. 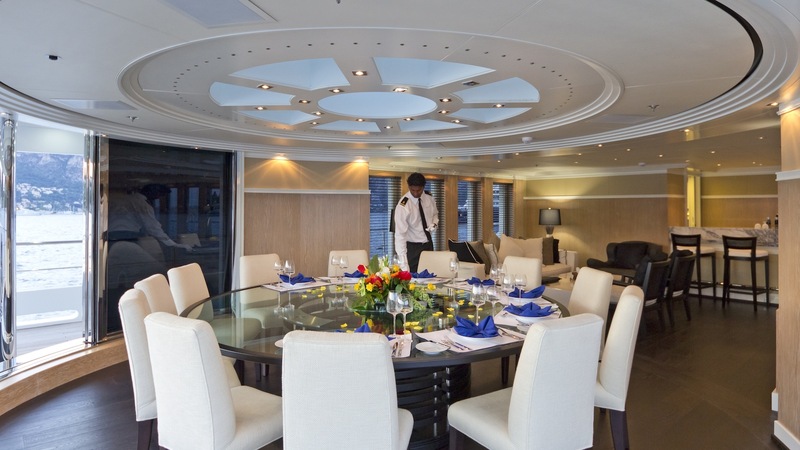 KINTA offers comfortable accommodation for 12 guests in 6 staterooms. 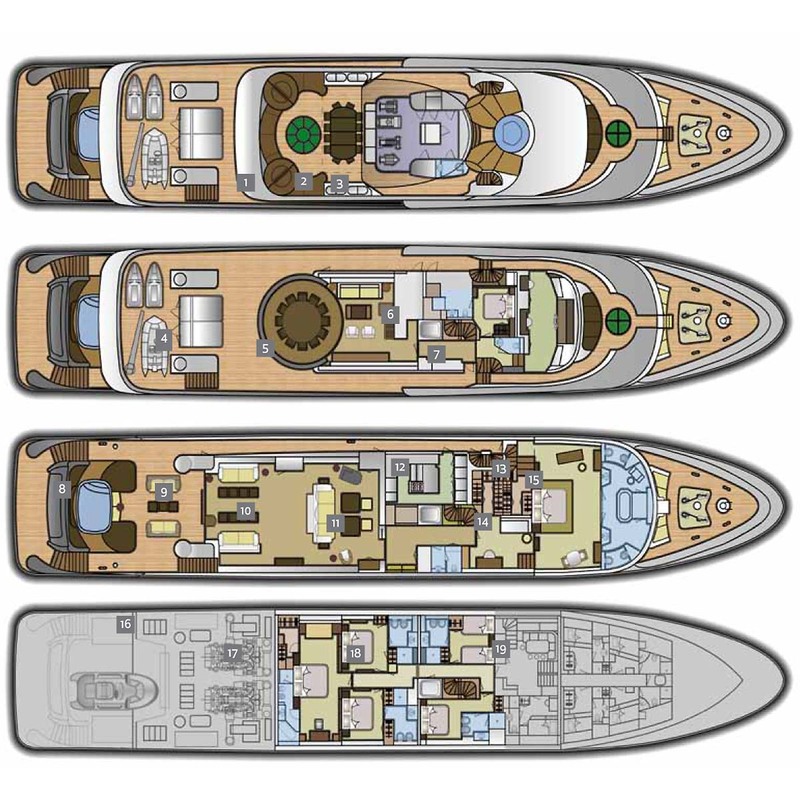 The full-beam master stateroom is situated on the main deck forward of the main lobby, while the VIP cabin is placed on the lower deck. 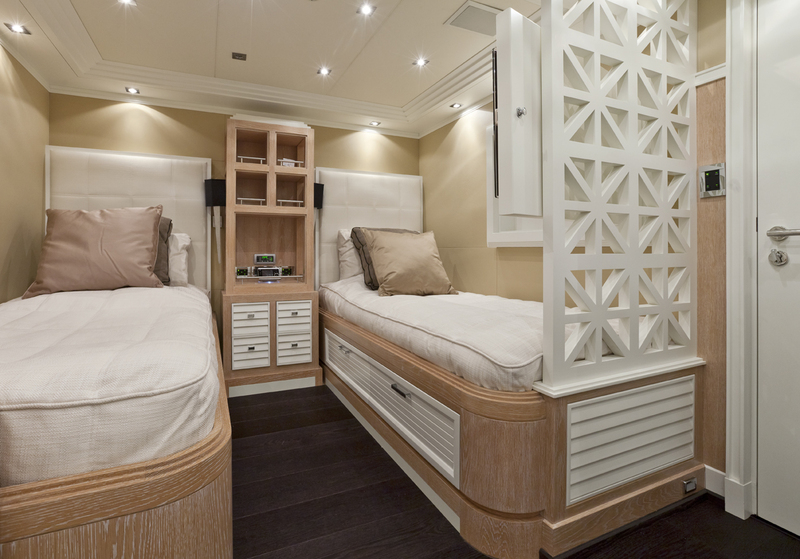 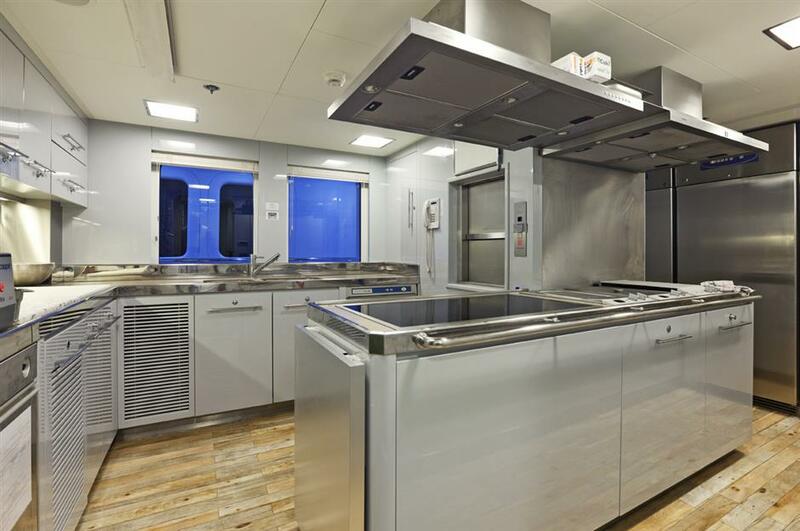 One port side twin cabin is located forward on the lower deck with en suite shower room. 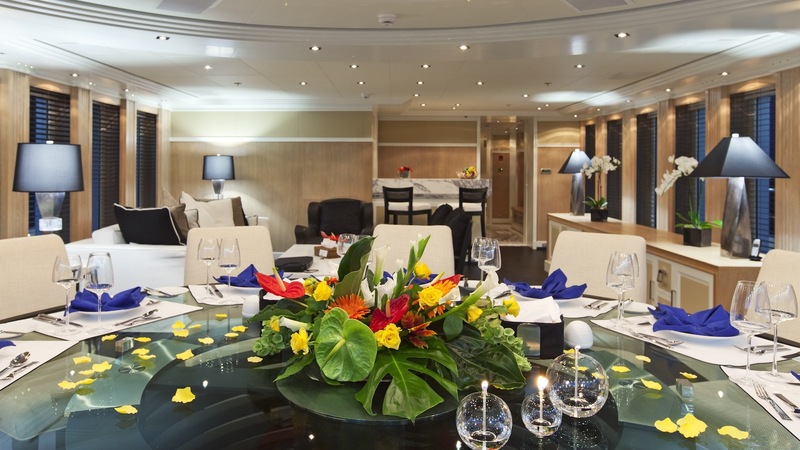 The three remaining double guest staterooms are also on the lower deck, with two to starboard and one to Portside, all with en suite shower facilities.